Your Doombuggy rounds the corner and enters the Mansion’s attic, a creepy menagerie of web-shrouded trunks, lamps, furniture and dishes. The deeper you go, the more dense and specific the items become—you see fine china, a rotting wedding cake, an embroidered wedding announcement…and then a ghostly bride. There have been so many changes in that scene in the last few years, and not just to the bride herself. 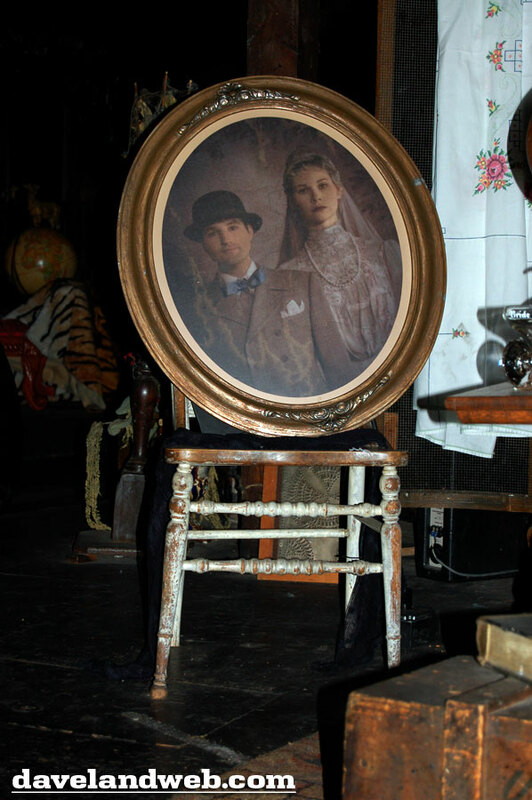 The last time I traversed the forbidden attic was in 2008, and I noticed for the first time that at least one portrait—that of the bride with one of her husbands—is in an oval frame. While it’s true that oval frames for portraits were quite common during the Victorian age, the bride’s portrait at its very core seems to have been inspired by Poe’s short piece. ٭ Poe’s “Oval Portrait” is a story within a story: it opens with the narrator and his valet stumbling into an abandoned mansion for shelter. In theHauntedMansionattraction, we play the role of the narrator: we have “stumbled” into a decrepit, abandoned (well, by LIVE people, anyway) mansion. A turret could certainly be comparable to an attic—high and tucked away—and notice that the turret’s furnishings could easily describe what’s in theHauntedMansion’s attic. 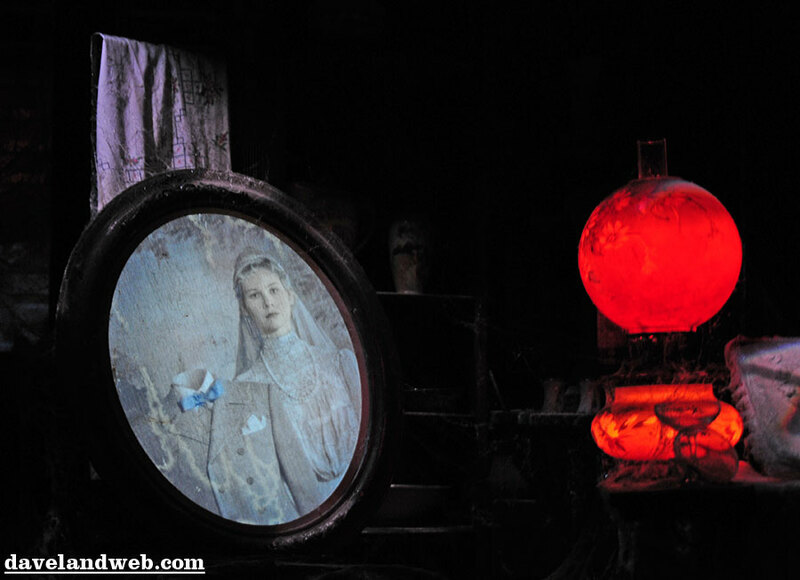 ٭ The comparison between the frames in “The Oval Portrait” and the Haunted Mansion is also worthy of note. “The Oval Portrait”’s frame is described as “richly gilded and filigreed in Moresque.” Another term for Moresque is Arabesque, which is a type of symmetrical scrolling (usually consisting of some kind of foliage). Take a closer look at the photo above. Note that the Haunted Mansion’s frame appears, although worn a bit, gilded—and that the silver scrolling on the top and bottom appears to be symmetrical: Arabesque (Moresque). The word “arabesque,” in addition, is used higher up in “The Oval Portrait”: “frames of rich golden arabesque.” So there may have been some consideration of this story here when the Imagineers were choosing the frame. ٭ Lastly, the tragic tale “The Oval Portrait”’s narrator reads in the volume is that of a young bride—and it ends in death. If you’d like to read Poe’s “The Oval Portrait”—a later version in which he removed some extraneous details about opium use—you can read it for free here: http://www.eapoe.org/works/tales/ovlprtb.htm (if you want to read the original 1842 version which includes the whole introductory paragraph at the beginning, you can do that here, although most published versions of this story never include it: http://www.eapoe.org/works/tales/ovlprta.htm). If you’d prefer to own it for your library, you can find it in The Complete Stories and Poems of Edgar Allan Poe here: http://amzn.com/0385074077. You can also get just the story “The Oval Portrait” for your Kindle here: http://amzn.com/B005EC3KI8; or, if you prefer to own his complete works for your Kindle, you can buy that here: http://amzn.com/B0038M2IMK. Edgar Allan Poe, “The Oval Portrait,” in The Annotated Tales of Edgar Allan Poe, ed. Stephen Peithman (New York: Avenel Books, 1986), 110.